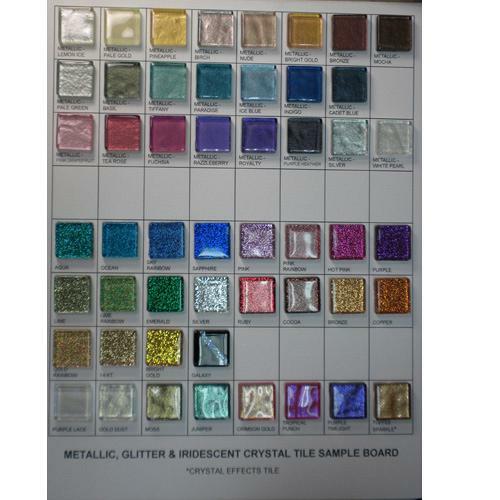 8.5" X 11" SAMPLEBOARD OF ALL GLITTER CRYSTAL, METALLIC CRYSTAL AND IRIDESCENT CRYSTAL COLORS. 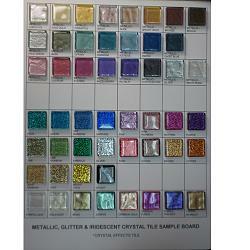 WILL BE DISPLAYED IN 3/4" TILES BUT ALL COLORS ARE AVAILABLE IN 3/8", 3/4", 1" AND 2" SIZES. LARGER SIZE TILES AVAILABLE INCLUDING SUBWAY TILE VERSIONS.